Fluids are shapeless. In more technical terms, we say that fluids do not resist shear. That is, it is relatively hard to bend a solid object, but a fluid splashes under the same force. 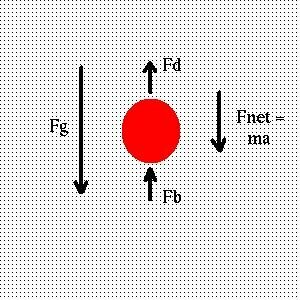 When a force is applied to a fluid, the pressure increases, but whereas the force is directional, the pressure is omnidirectional. Consider the force applied to the surface of a glass of water by the atmosphere. That force is downward, but the resulting pressure is felt throughout the water. If we measure the pressure at any given depth, it is the same on all sides of the measuring instrument. 1 P = 0.1 kg / (m s). = 1 g / (cm s). The viscosity of water is .01 Poise, and the viscosity of blood is .04 Poise. the velocity does not depend on the angular position on any concentric circle, but only on the distance from the center. The fact that the velocity is constant on each circle leads us to think of the fluid as flowing in concentric sheets, but in fact the velocity is a smooth function of distance from the center. For higher viscosity, the velocity gradient is shallower. Essentially, viscosity opposes the existence of steep velocity gradients. The larger the viscosity, the gentler is the shape of the parabolic velocity gradient, and the velocity is more nearly constant across the section. Fluids are subject to turbulence. Smooth flow is called laminar, implying that layers of fluid flow past each other in a sheet-like fashion. The flow is turbulent when eddies and vortices (whirlpools) occur. Fluids lose energy through dissipation in both types of flow. During laminar flow, the viscosity causes dissipative losses between the sheets of fluid: the fluid resists changes in the velocity gradient, and that costs energy. In turbulent flow, energy is required to create the eddies and vortices, resulting in an energy loss by the fluid as a whole. where ΔP is the pressure drop experienced by the fluid as a result of viscous losses along the length l of the pipe. We would like to use Poiseuille's Equation to discuss the blood vessels in animal circulatory systems. While the flow is essentially laminar outside of the capillaries, it is pulsatile throughout the arterial subsystem: the pressure varies as a periodic function of time. In addition, the equation is based on the parabolic velocity gradient, but since pressure waves in arterial walls propagate more quickly than those in blood, the velocity profile is more uniform than parabolic. Beyond that, Poiseuille's Equation assumes a constant viscosity, whereas the viscosity of blood actually changes with velocity, since blood is not a uniform fluid. In fact, the viscosity is much lower in the capillaries than in the rest of the system, since the red blood cells line up in single file to pass through them. On top of everything else, the blood vessels are not straight, uniform pipes! All of these reservations notwithstanding, we can apply Poiseuille's Equation to the circulatory system to understand the scaling relationships between the various parameters. For instance, an occluded artery is often the subject of angioplasty or even bypass, in order to increase the inner radius of the vessel. We can use Poisseuille's Equation to understand the functional dependency of flow on radius: since flow is proportional to the fourth power of radius, we see that increasing the radius by a factor of 2 results in an increase in the flow rate by a factor of 16. We say that the flow scales with the fourth power of the radius. In a similar fashion, we can relate any two of the variables, holding all of the others constant. Since flow is equal to velocity times cross sectional area, we can also relate the blood velocity and therefore the Reynold's number to the other parameters. It is necessary to have a single equation which contains exactly two interrelated variables in order to deduce a scaling relationship. In the event that three variables are interrelated through two or more equations, one variable must be eliminated. Any single equation which contains three interrelated variables is insufficient to deduce the relation; in that case a different equation is necessary. Note that in this applet, the answers must be exact! Remember that answers less than one must be entered as fractions (ie., 1/2). This pressure is independent of any atmospheric or surface pressure exerted at depth d = 0. Fd = - b V.
b0 = 6 π η r.
For other shapes, we multiply by a shape factor b / b 0 which depends on the shape of the object; for a more cylindrical object, the shape factor might be around 1.5. Fb = m v ρ g.
Here v is the specific volume of the object (volume per unit mass). Thus m v gives the volume of the object, and ρ g gives the gravitational force per unit volume of the fluid. Vt = (1 - v ρ) m g / b. Note that the hydrostatic pressure does not affect this result, since it exerts a force on the object equally in both the upward and downward directions. The molecules rapidly reach terminal velocity, and the measurement of the velocity (or correspondingly, the distance the molecules travel in a given time) determines the charge on the molecule. Provided that the molecules have been denatured (unfolded) and charged by the addition of an anionic detergent like sodium dodecylsulfate (SDS), the charge will be proportional to the mass of the molecule and the molecular weight can be determined. The next section builds an electrical analogy to fluid systems.